Here’s what I’m knitting right now. This year’s Sarah-Katrin Christmas exchange was dialed down to 5 — a new baby and a half-time job don’t leave me quite enough time to take on a whole sweater, as we’ve done in years past. And anyway, Katrin’s racing to finish the most enviable sample knit. So we’ve decided on a nice, easy triangular shawl pattern: Kristen Hanley Cardozo’s Clothilde, which I’ve been wanting to knit since she first published it. I had a nice slate grey cashmere blend from School Products marinating in the stash; Katrin chose this fabulous, fabulous Tosh Merino Light in “tart.” People, I could knit this yarn till the cows come home. Stinking FABULOUS, I tell you. That is all. That color! Good choice on the shawl. I knit Clothilde for myself and use it a lot, the “architectural design” apeals to me. Better to knit something small and enjoyable than stress out! The pattern is so elegant–and I love the fact that its sister pattern is named after a character in Jonathan Strange and Mr. Norrell. It is a book made for knitwear–so many cold, snowy scenes and drafty houses! I happened into a local shop the other day shortly after a delivery of Tosh, and the Tart kept drawing my eye in every base (I ended up springing for a few skeins of it in Vintage). Such a gorgeous color. Clothilde will look awesome in it! That’s a lovely color. 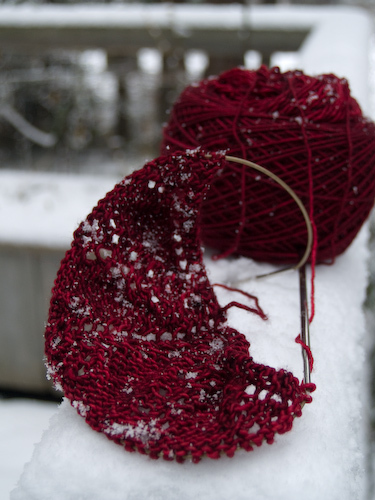 I can’t wait to see your finished shawl!